Liquid laundry detergent capsules are a really convenient laundry innovation. This was made possible by putting all the active ingredients of a liquid detergent into one small capsule. This capsule dissolves inside the washing machine, and then releases the liquid detergent to do its job. Laundry capsules are perfectly safe when used in accordance with the instructions provided on-pack. Actually you never even get into contact with the detergent that’s inside the capsule. This detergent is stronger than a usual concentrated liquid detergent. With all the washing strength contained in such a small dose, it is in fact about two times more concentrated. For safety, the capsules are designed to resist a certain pressure and to not dissolve too quickly, but if a child puts a capsule into it’s mouth and bites into it, the water-soluble film that contains the detergent may break. At this point the capsule can release its content. This can lead to severe vomiting or irritation, and thus can hurt the child. We all know that toddlers put almost everything they can get their hands on into their mouth. That is why it is so important to make sure children can never ever get hold of a liquid laundry detergent capsule. Not while the product is in storage. Nor while you are doing the laundry. Always keep caps from kids. Always store packs with liquid laundry detergent capsules in a place that is not reachable by children. Best even out of their sight. You can read more about storing capsules safely here. Always keep the capsules in their original packaging, and always make sure you close the pack properly. When you’ve taken a capsule out of the pack to do the laundry, make a habit of it to re-close the pack right away. A child might otherwise manage to grab a capsule out of the open pack within a split second. Children love to imitate adults. So if you’ve just taken a capsule out of the pack, you can imagine what a child would like to do too! Next, put the capsule directly into the drum of the washing machine, and close the machine door immediately. Even if you need to step away from the machine for only an instant to get the laundry. Children are surprisingly quick when they want to take something they find interesting. Such as a liquid laundry detergent capsule that is inside the washing machine. Or on top of it. Or on top of the dirty laundry in the laundry basket. So as a general rule, never leave a liquid laundry detergent capsule outside of its pack or outside of the closed washing machine, even if it is only for a very short time. It goes without saying that you should never ever give a liquid laundry detergent capsule to a child, to help with the laundry, or to play with it. If a capsule is accidentally dropped on the floor, make sure you find it and pick it up immediately. And if you need to throw away a capsule for whatever reason, make sure a child cannot easily take it out of the dustbin. Once you’ve put the liquid laundry detergent capsule safely into the machine drum, don’t forget to put the pack back into its safe storage place, and to close the child-safety lock on the cupboard if you don’t have a high storage place. Liquid laundry detergent capsules may be dangerous if young children get hold of them; they could severely hurt them. Make sure a child never gets the opportunity to grab a capsule. Store capsules in their original packaging, properly closed, in a space that children cannot reach. 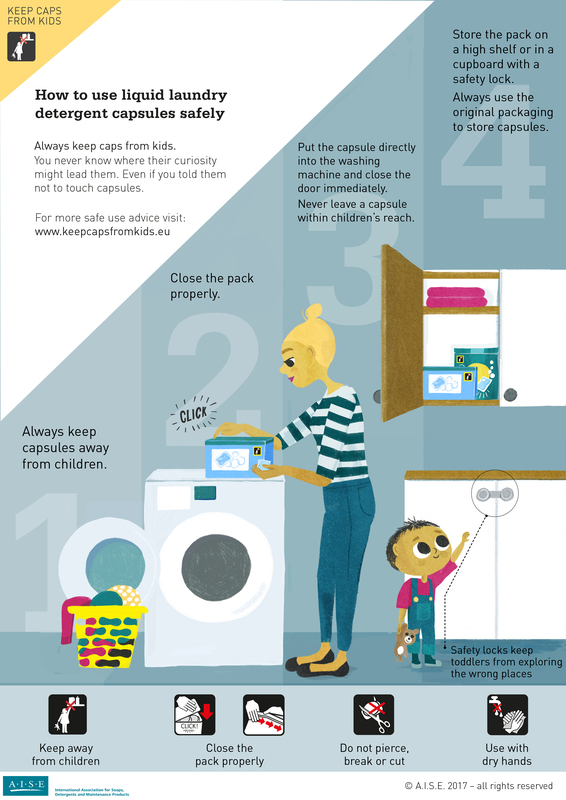 When you do the laundry, close the pack right away after you take a capsule out, and make sure that a child can never touch the capsule – not even for a split second.